Fisker Automotive filed for Chapter 11 bankruptcy protection on Friday after lengthy efforts by investors to salvage the company. The filing comes after the Anaheim, California-based company agreed to sell itself to an investor group, Hybrid Technology LLC. The group bought a loan extended by the U.S. Department of Energy, originally worth $168 million, for $25 million. In all, the DOE has recouped about $53 million on its $192 million investment in Fisker. In a statement, Hybrid Technology said the purchase of the government loan was the first step toward eventually restarting production and sale of the Karma, which Fisker has not built in about 18 months, and the development of other hybrid-electric vehicles. "As we continue to examine Fisker's opportunities, we will be making decisions about the structure and footprint of the new business," a spokeswoman for Hybrid Technology, Caroline Langdale, said in a statement. Although the design of the Karma drew rave reviews, it had many quality problems that hurt the company's image and drained its cash. 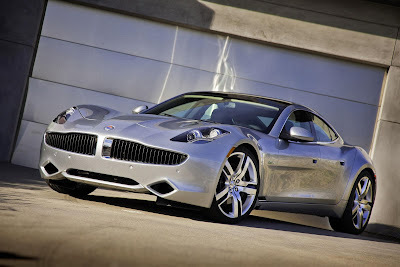 In April, Fisker fired most of its staff to save cash following an unsuccessful search for a buyer. Its financial woes left Fisker unable to repay millions in outstanding bills to suppliers. The DOE put the loan up for auction in mid-October. A subsidiary of Hybrid Technology, Hybrid Tech Holdings LLC, is purchasing Fisker's assets and will provide $8 million in debtor-in-possession financing. Fisker won a $529 million loan in 2009 as part of the Obama administration's effort to boost advanced vehicle development in the United States. But the DOE froze Fisker's credit line in mid-2011 after the company missed certain performance targets. Fisker's struggles also fueled Republican criticism of the DOE's role in promoting green cars.